Flow chart for smear preparation of flagella staining. 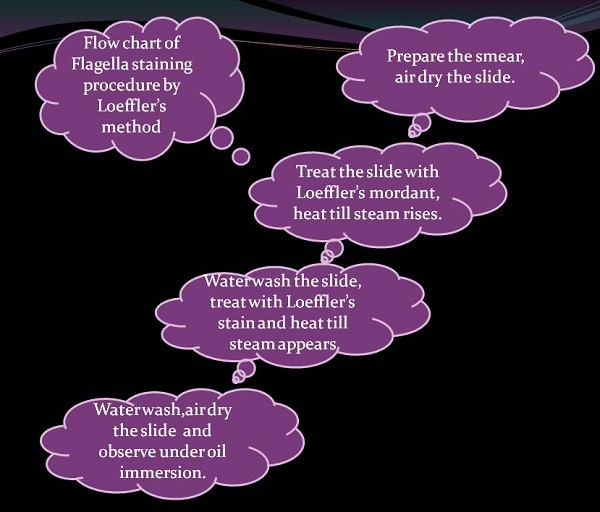 Flow chart of flagella staining procedure by Loeffler’s method. As we know flagella of a bacterial cell are very thin,hair like structure .This delicate structure can easily get destroyed so here there is no heat fixation step. Now it is very important to increase the thickness of flagella so that we can stain it and observe it under microscope. So here in this staining technique we use Loeffler’s mordant this mordant contains some colloidal particles with alcohol base. Now when we apply this mordant and heat it the alcohol get evaporated and the colloidal particles get adhere to the flagella and increase its thickness. Further this smear is treated with Loeffler’s stain.This stains precipitate on flagella and thus stains the flagella as well as cell in pink colour. Here Flagella as well as bacterial cell get stain in pink colour.